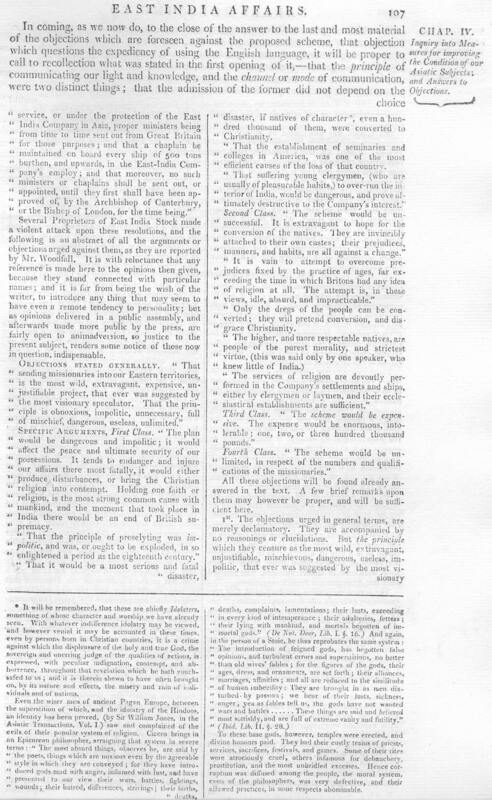 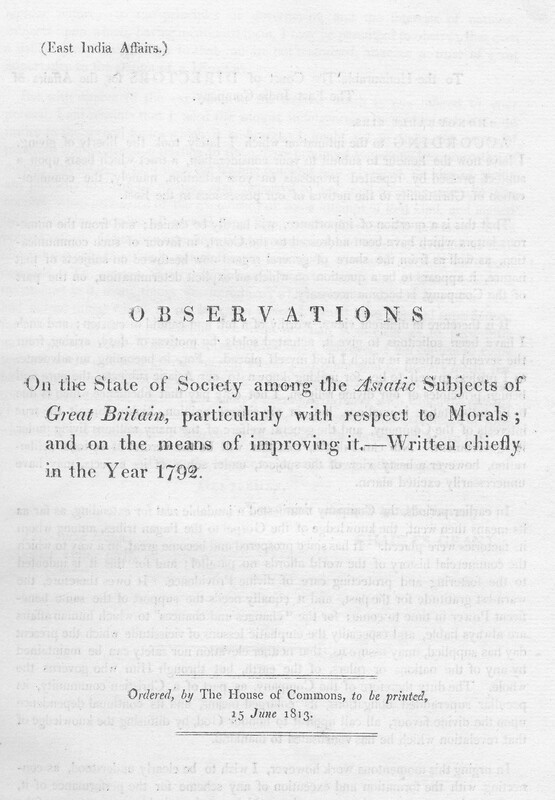 On the State of Society among the Asiatic Subjects of Great Britain, particularly with respect to Morals; and on the means of improving it.—Written Chiefly in the Year 1792. 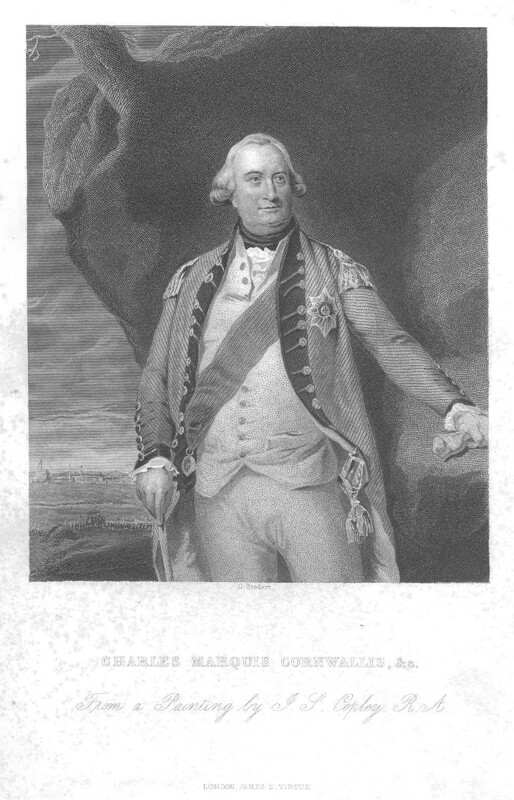 Born at Aldourie, Inverness-shire, Scotland, Grant went to India in 1767 in a military role. 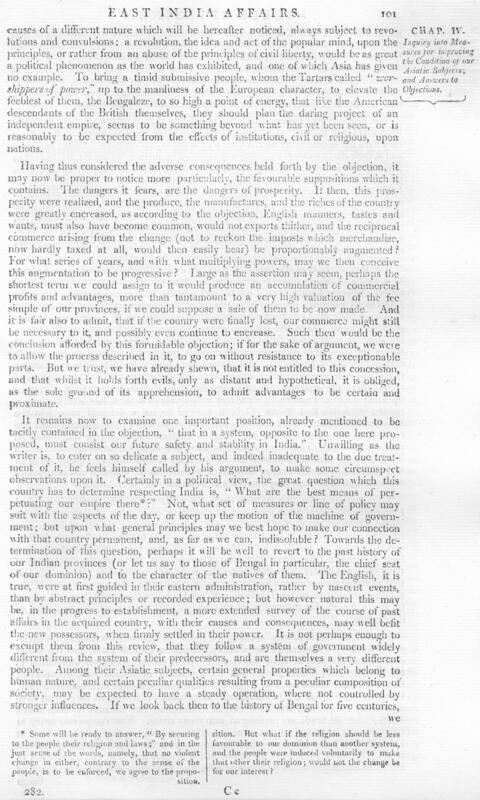 Later through a variety of friends and acquaintances, he rose to the eminent position of superintendent over all of the East India Company's trade in Bengal. 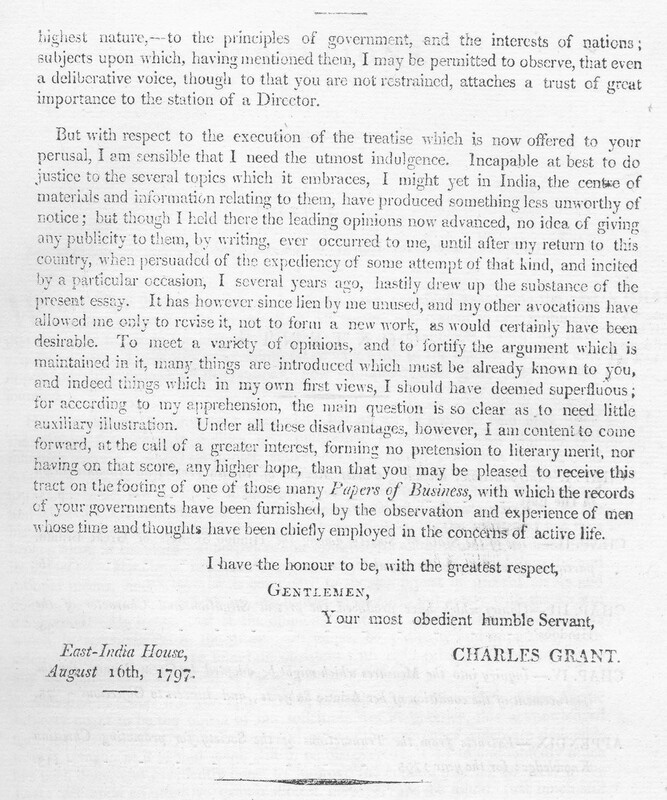 Returning to Britain in 1790, Grant became a leading British statesman prior to his death in Russell Square, London, October 31, 1823. 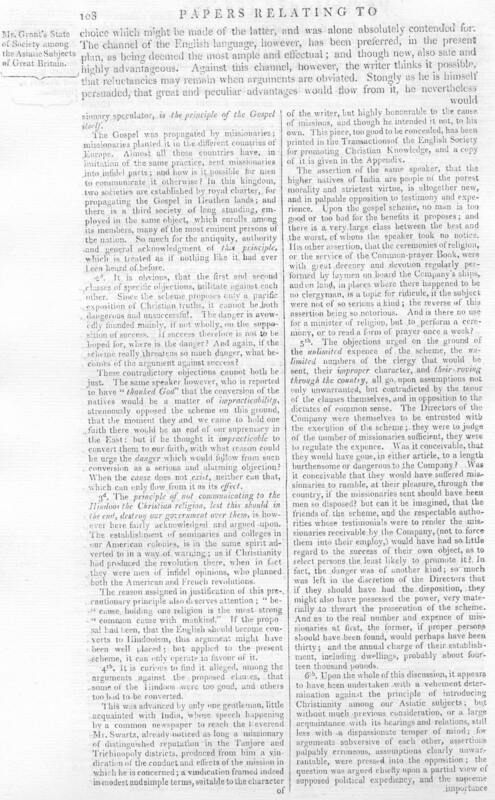 Prior to his ascendancy in the East India Company, Grant had become a close friend to the Rev. 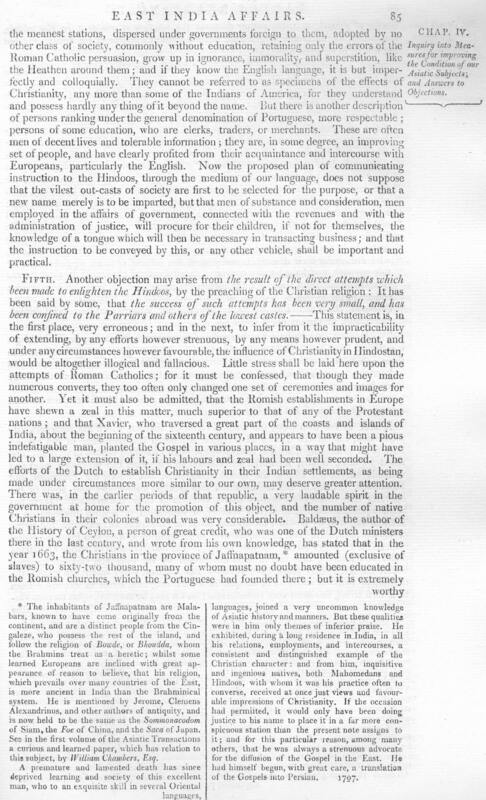 Christian Friedrich Schwartz, the Danish missionary to India. 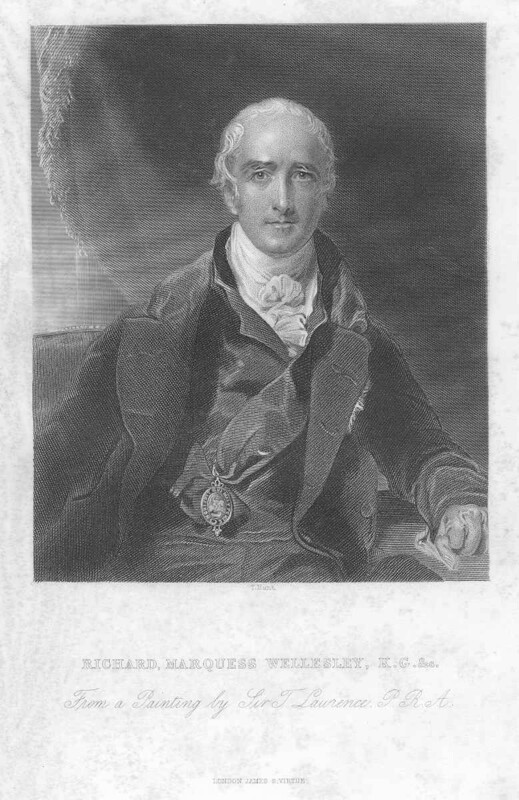 After Schwartz's death in 1798, Grant persuaded the East India Company to erect a monument in honor of Schwartz in St. Mary's Church, Fort St. George. 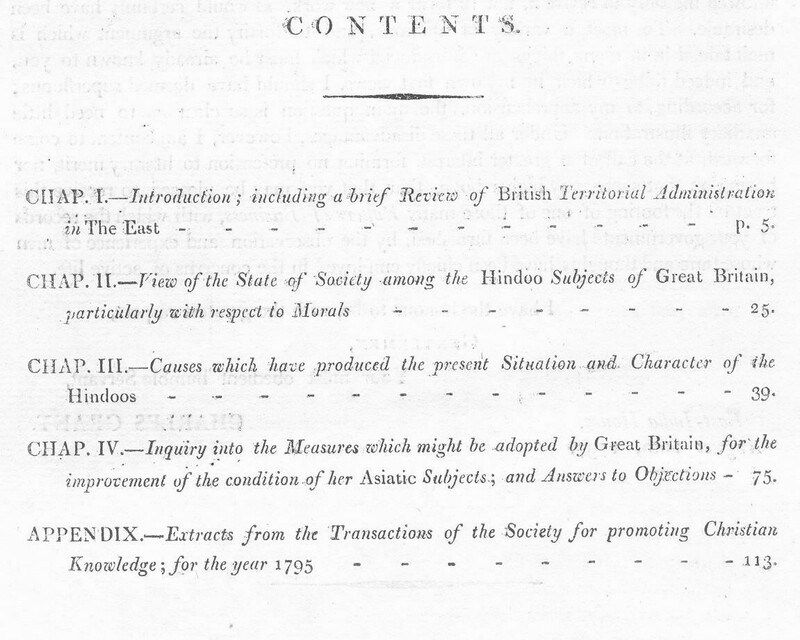 One of Grant's accomplishments included acquiring a large fortune through silk manufacture in Malda, India, which resulted in Governor-General Cornwallis appointing Grant as a member of the East India Company's board of trade in 1787. 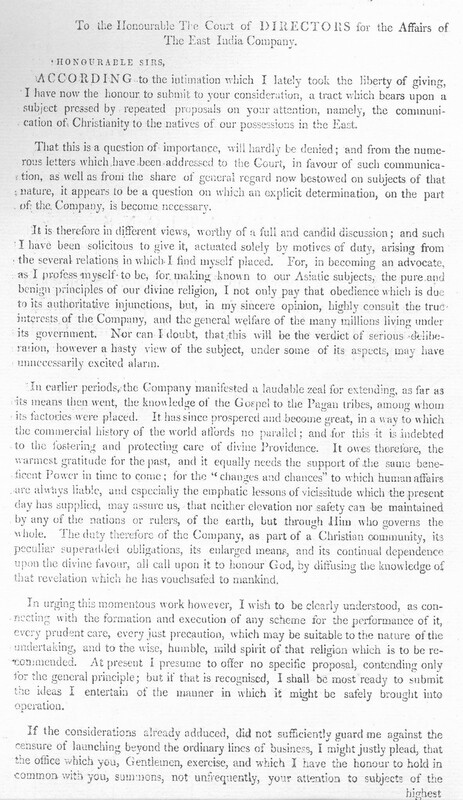 Later in 1805, Grant became the chairman, Court of Directors, East India Company, and he used his influence to sponsor many chaplains to India, including Claudius Buchanan and Henry Martyn. 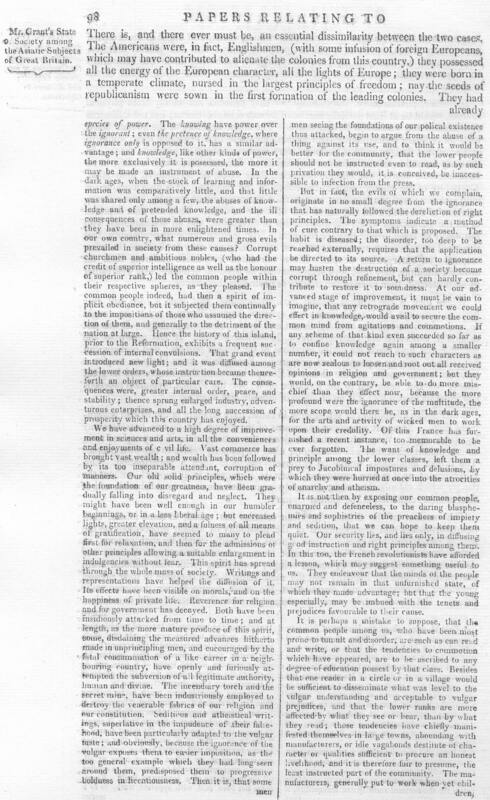 At Grant's death, one of his friends, Rev. 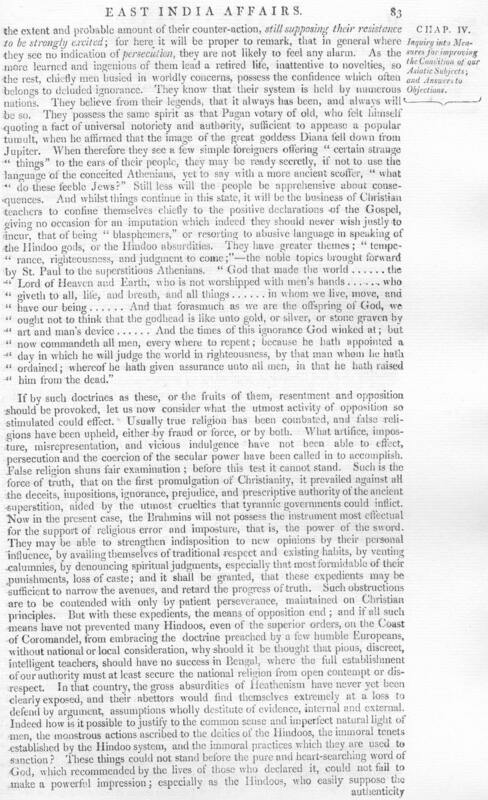 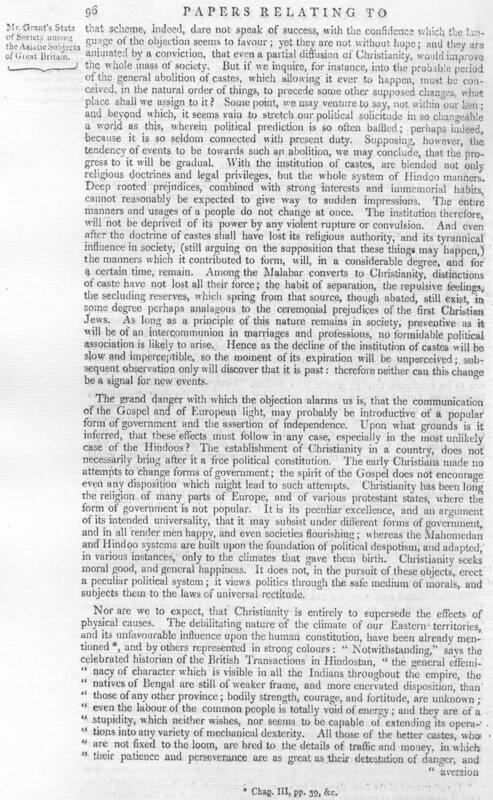 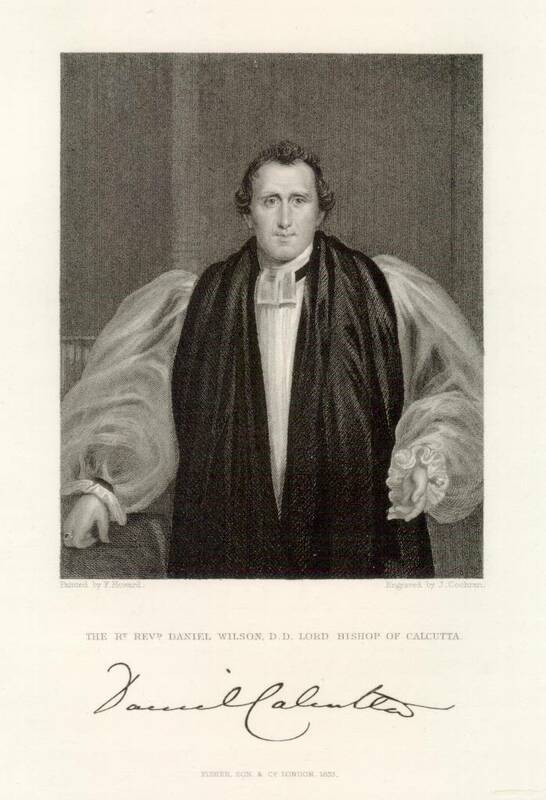 Daniel Wilson (who later became Bishop of Calcutta, 1832), preached Grant's funeral sermon. 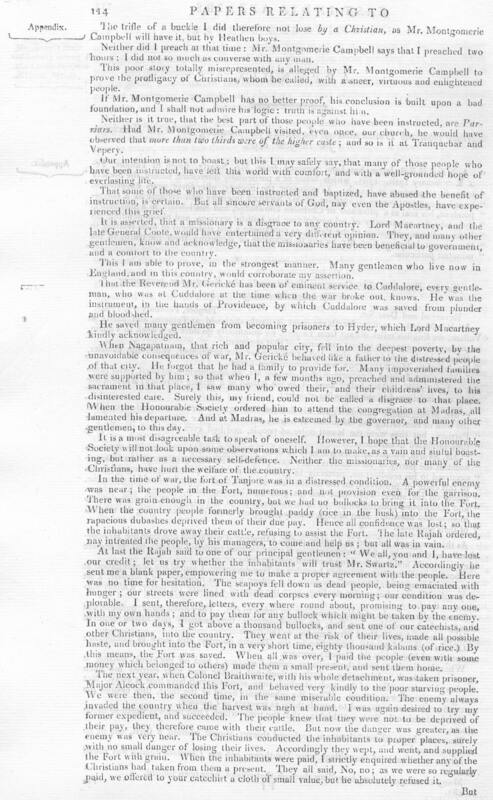 Elected to Parliament in 1802 from Inverness-shire, Grant served as an MP until failing health forced him to retire in 1818. 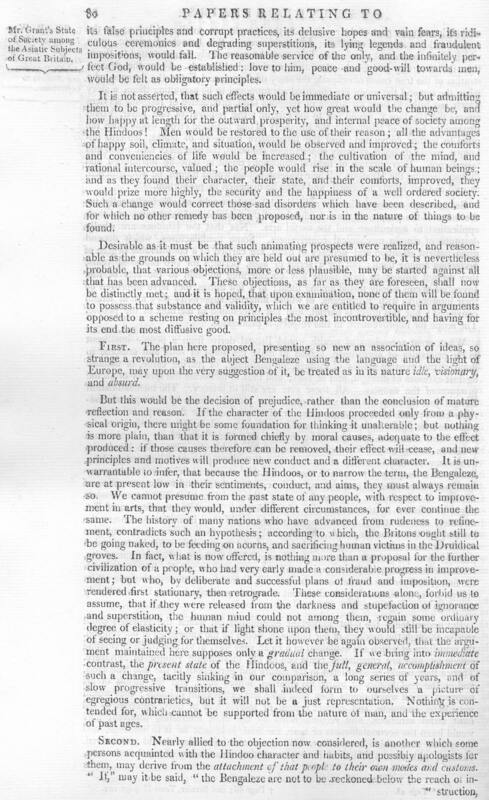 While in India and later in the British Parliament, Grant exerted much influence in the areas of education, social and public policy, and Christian missions. 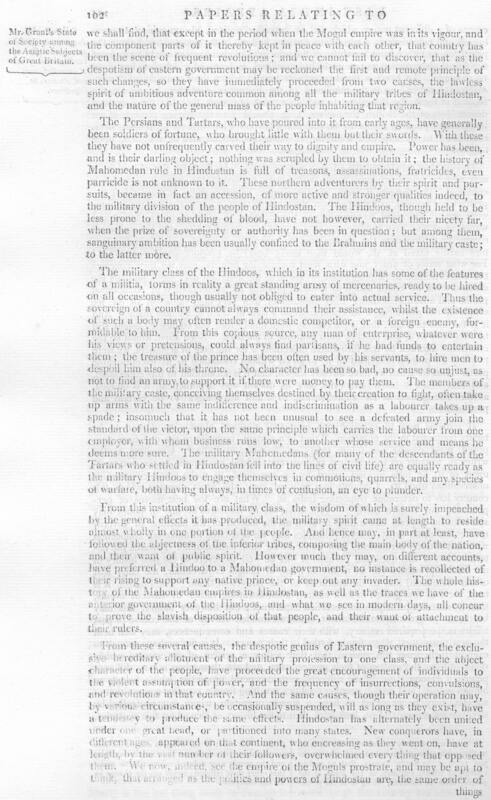 Grant was a leading figure in the establishment of the Sierra Leone Company (1791), which helped give refuge to freed slaves. 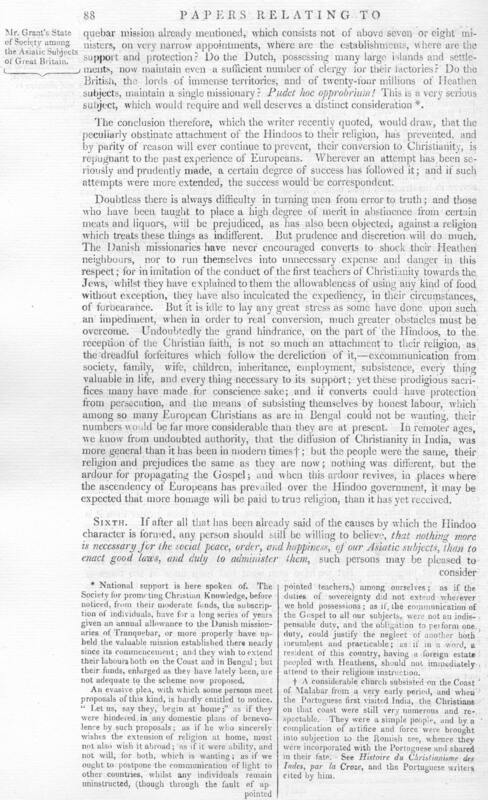 Religiously, Grant served as a vice-president of the British and Foreign Bible Society at its founding in 1804, and crusaded for the Church Missionary Society and the Society for the Propagation of the Gospel. 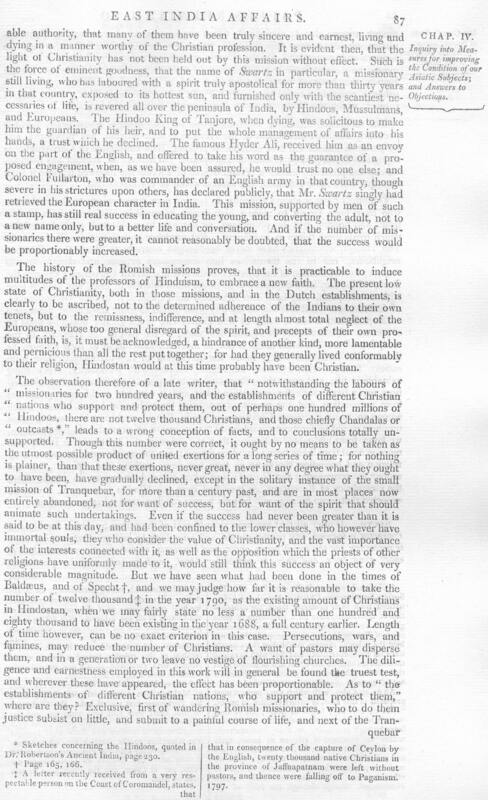 Grant also helped in the construction of the church of St. John in Calcutta. 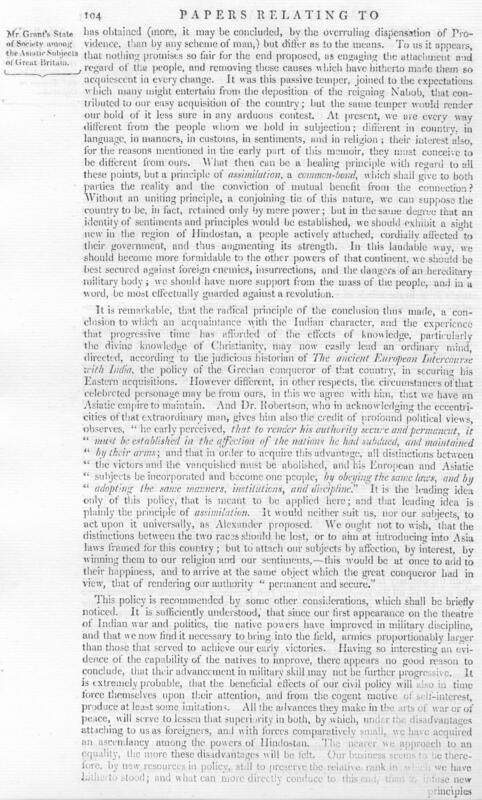 Politically, Grant opposed Governor-General Wellesley's war policies against native Indians, and Grant supported the Parliamentary move to impeach Wellesley. 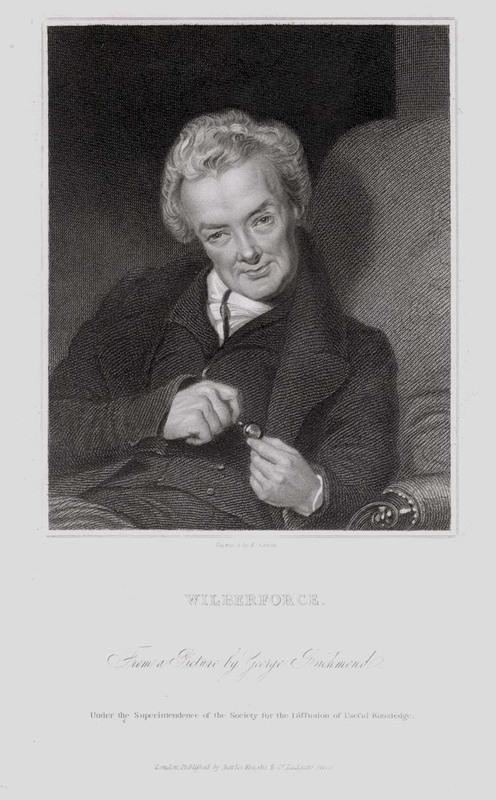 Other aspects of Grant's social conscience and evangelical identity included his close friendship with various members of the Clapham Sect, not the least of which was William Wilberforce, an outspoken abolitionist and evangelical leader. 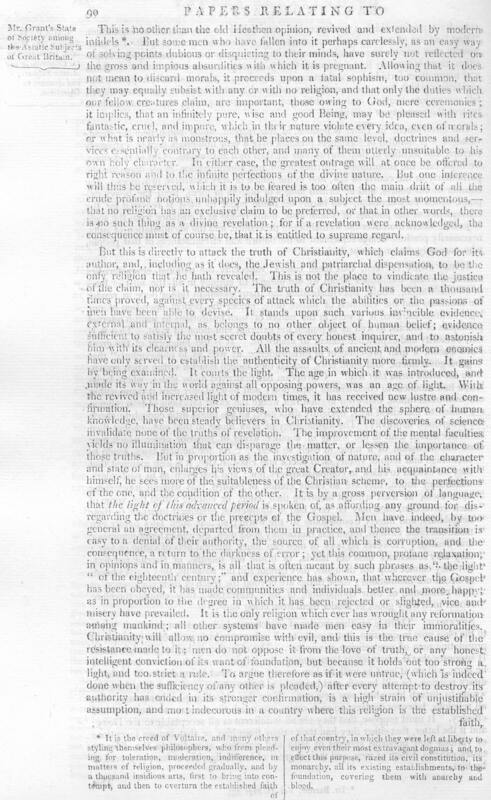 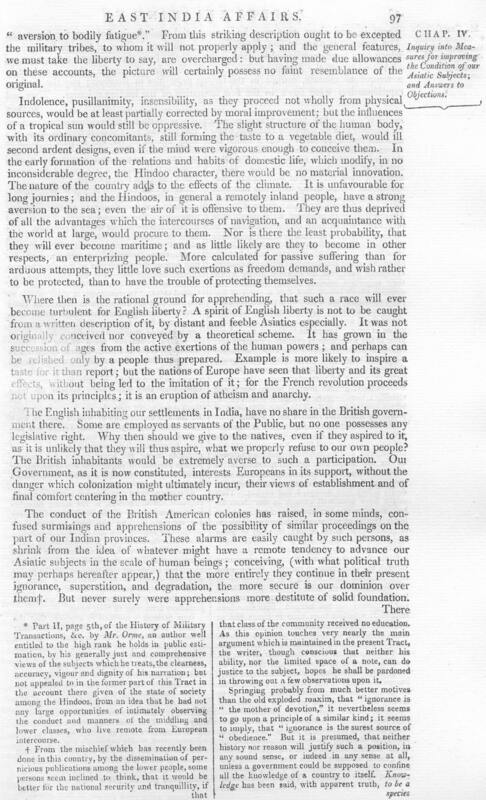 Of greatest significance, Grant sided with Wilberforce in 1813 as the two successfully sought to increase education and Christianity's presence in India alongside the East India Company's commercial interests. 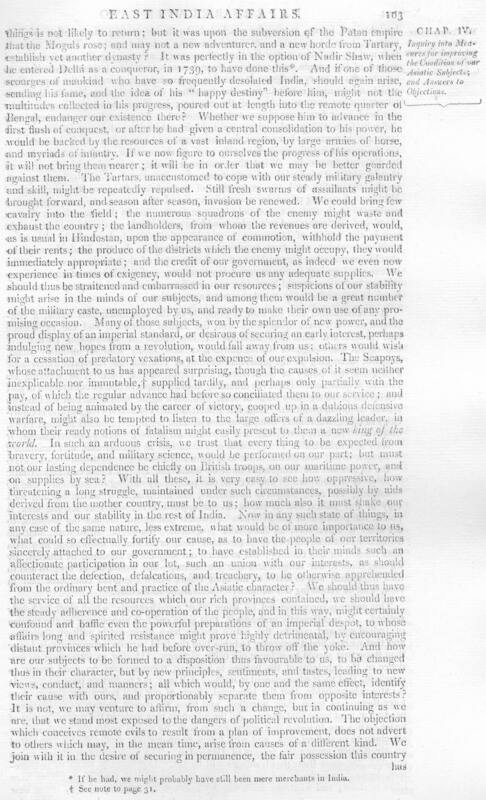 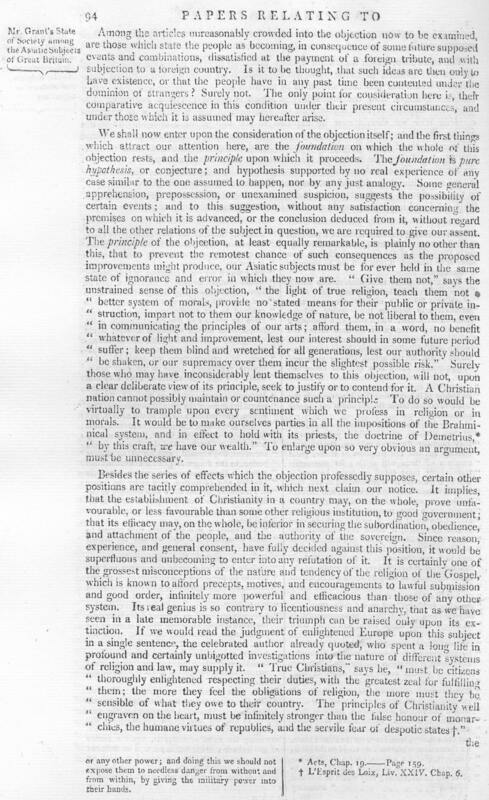 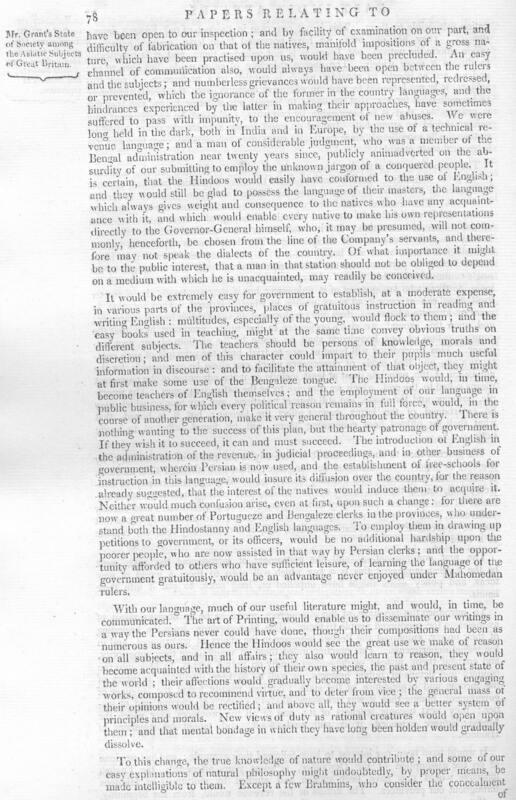 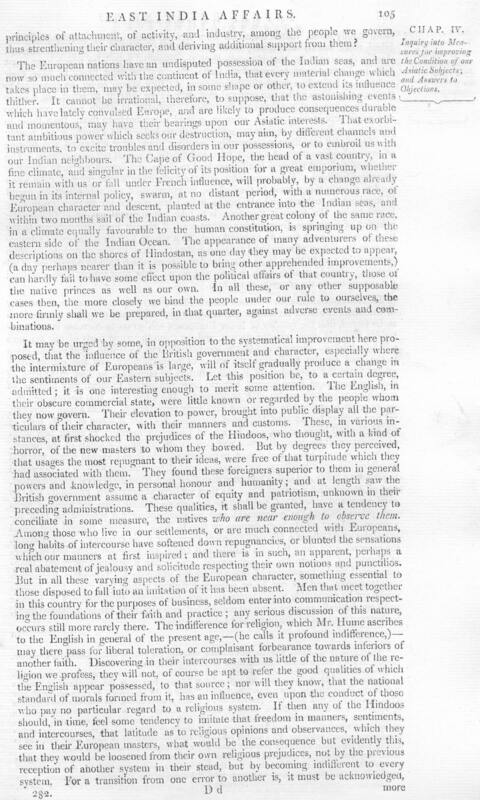 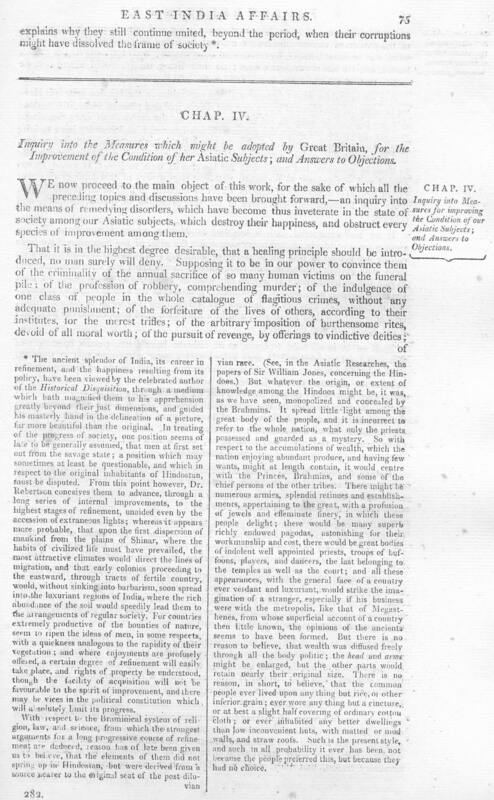 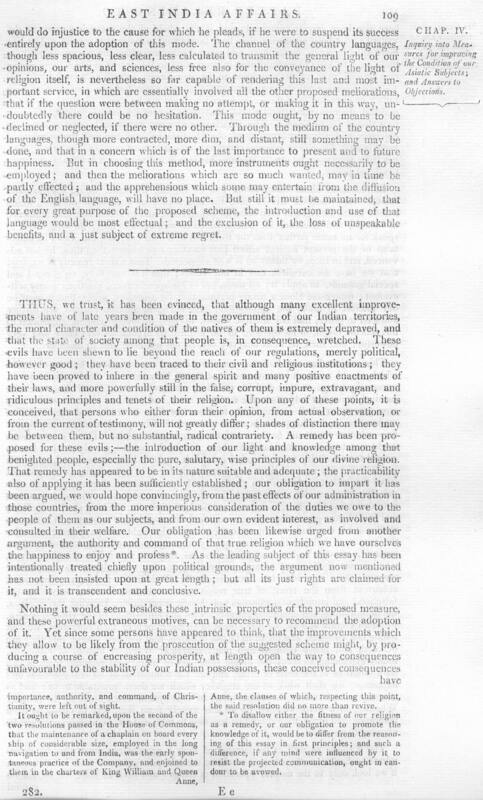 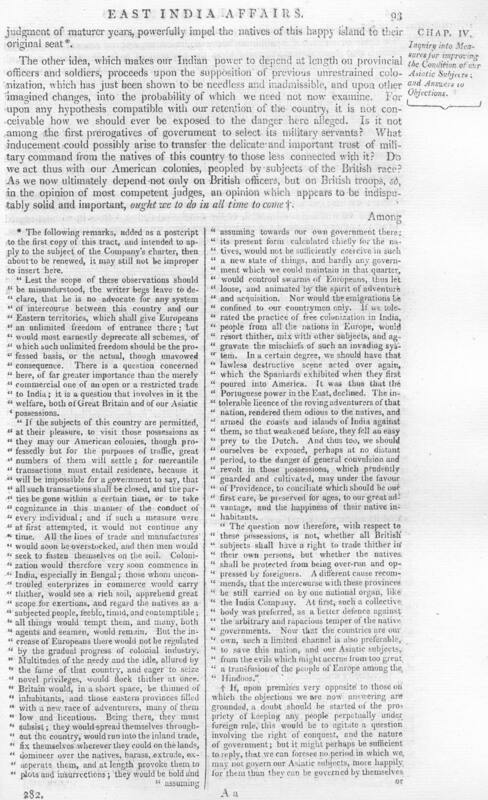 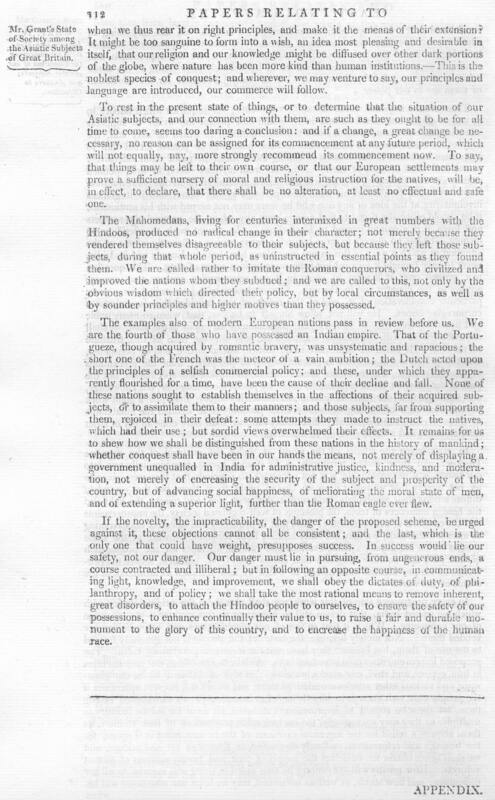 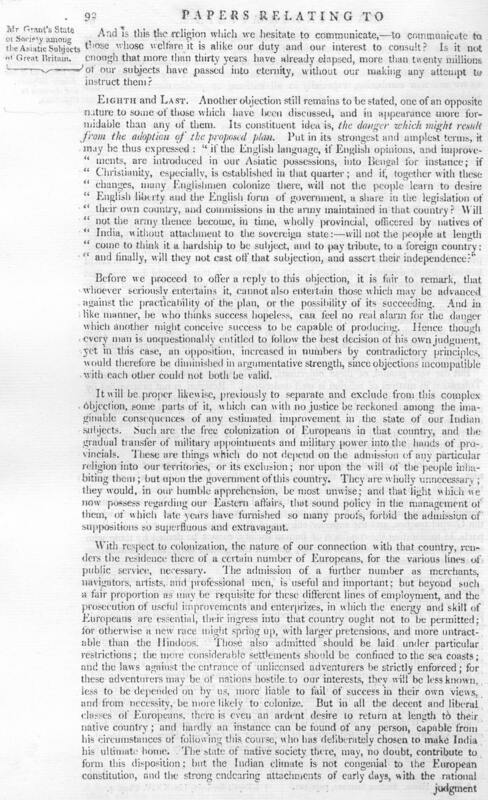 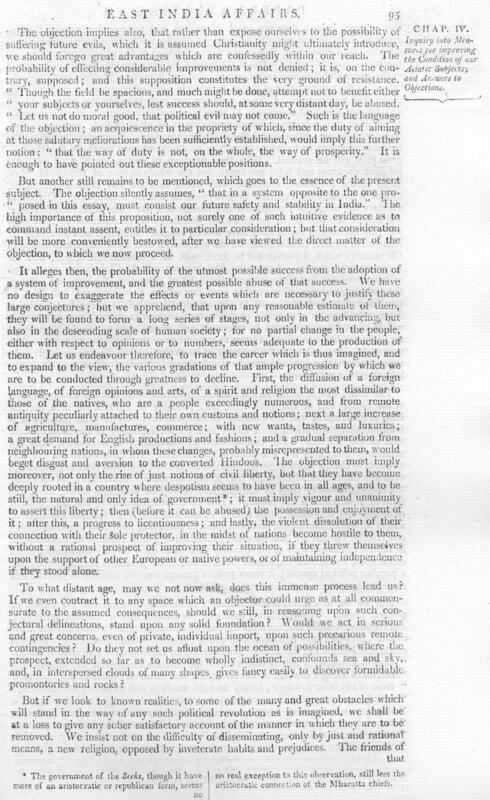 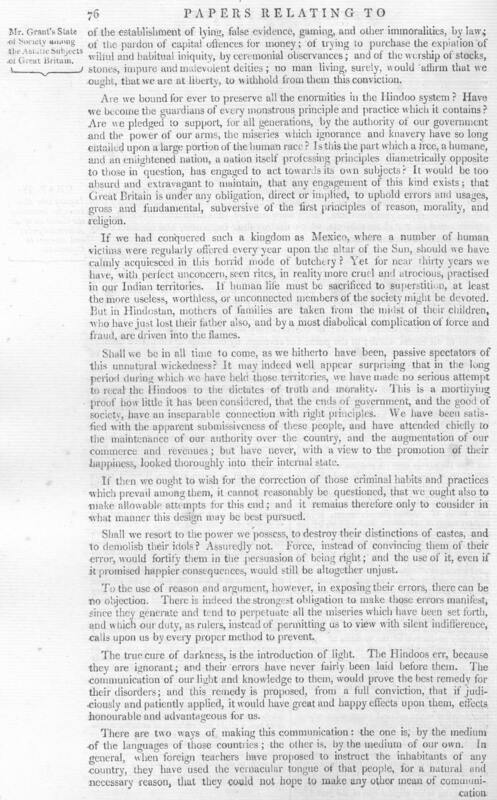 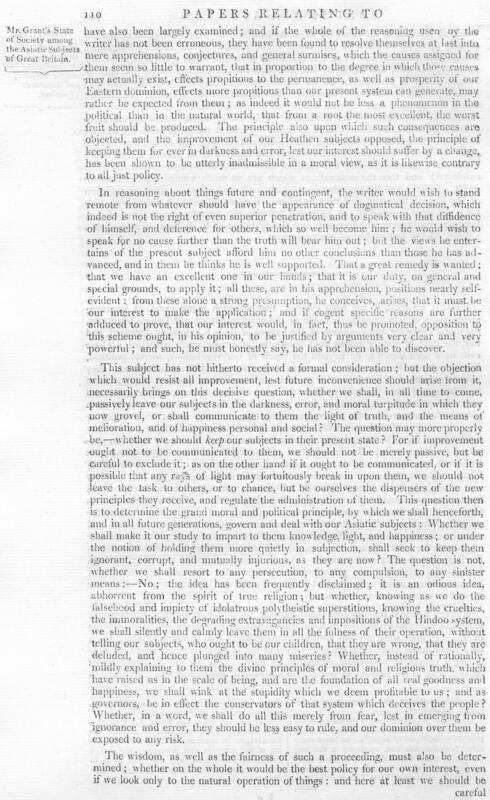 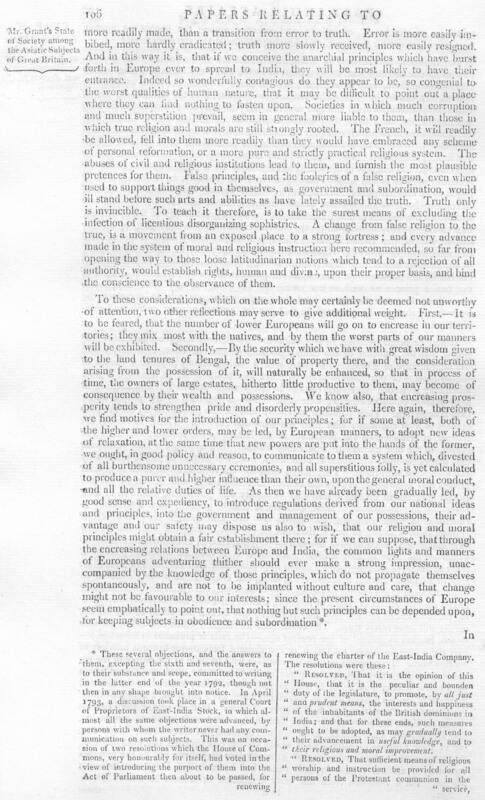 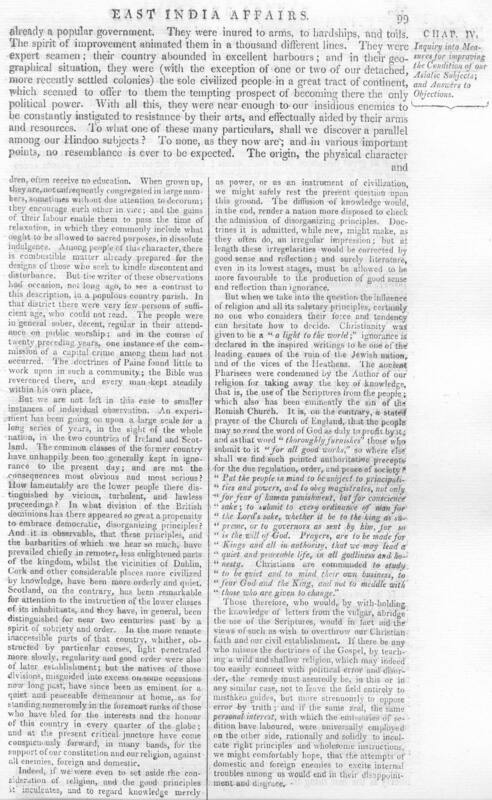 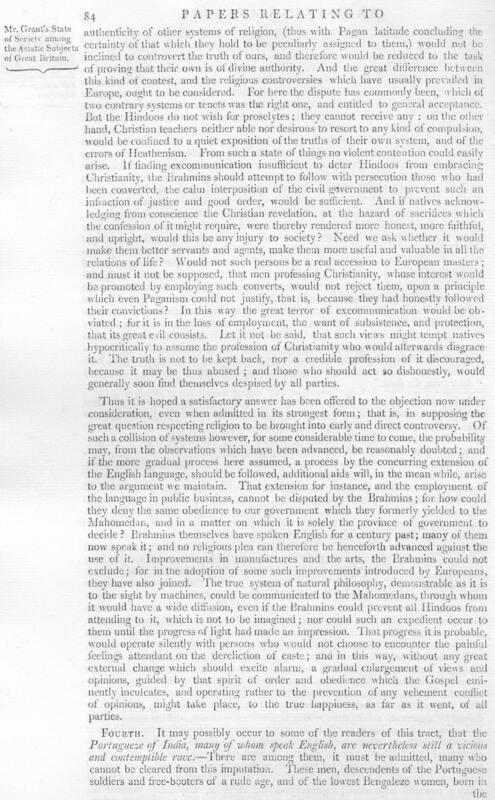 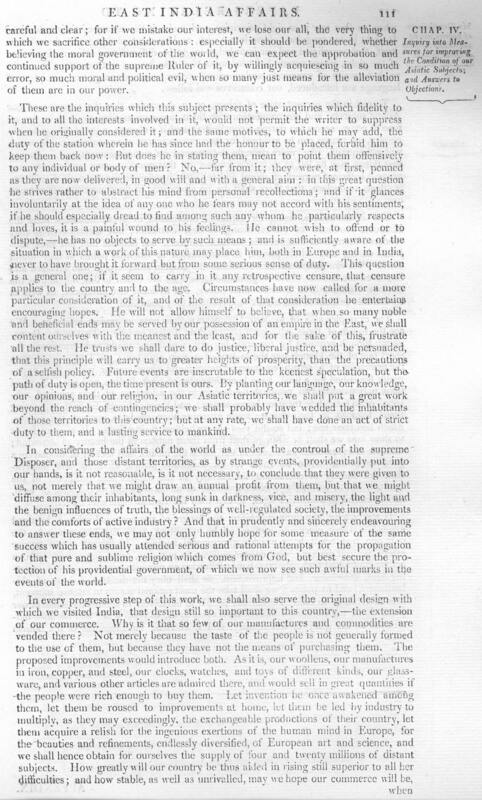 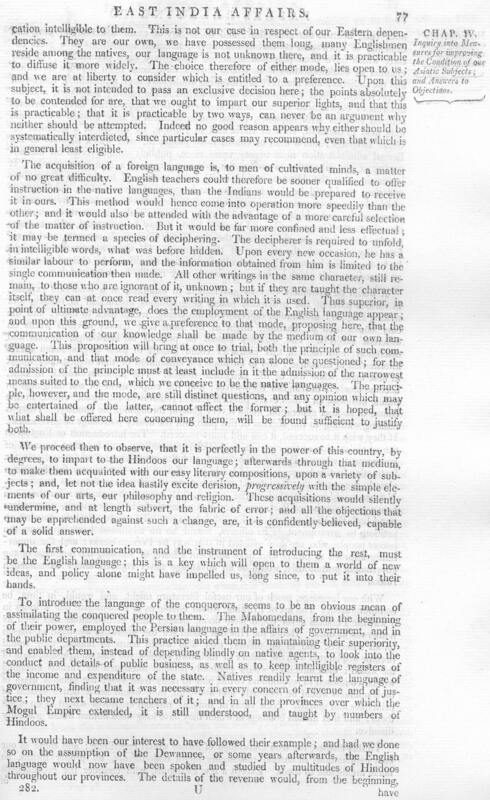 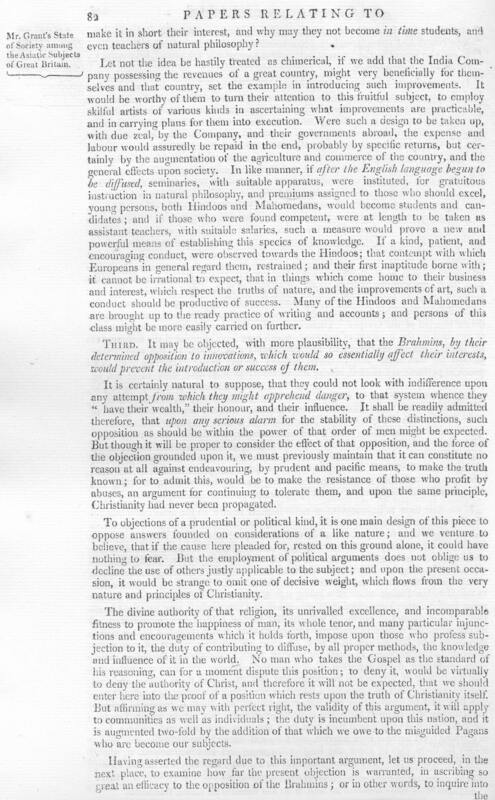 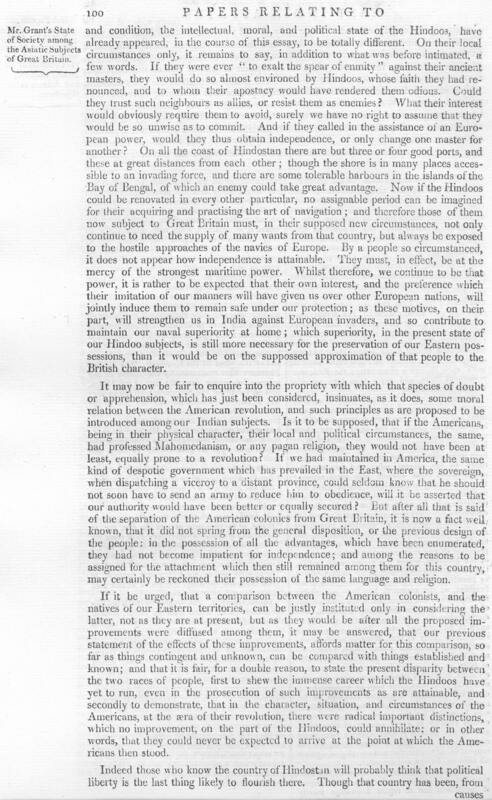 In 1792, Grant wrote "Observations on the State of Society among the Asiatic Subjects of Great Britain." 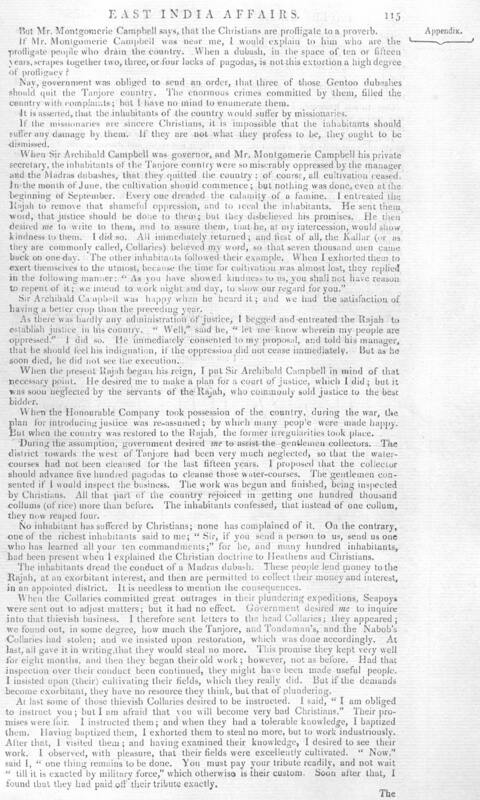 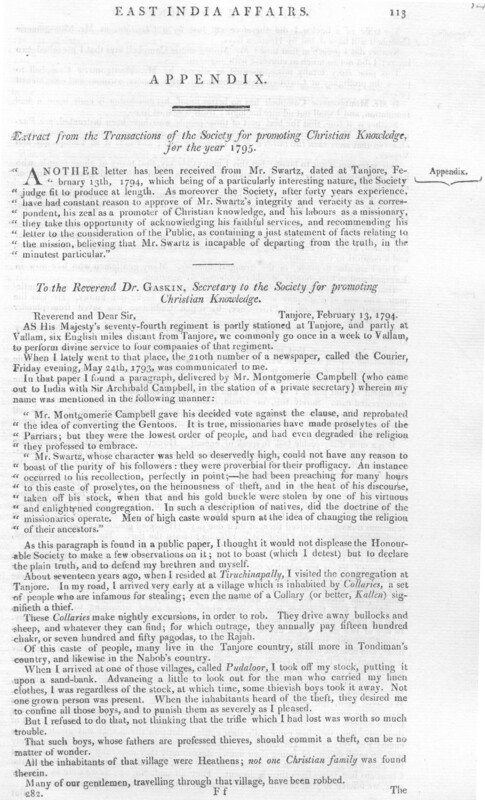 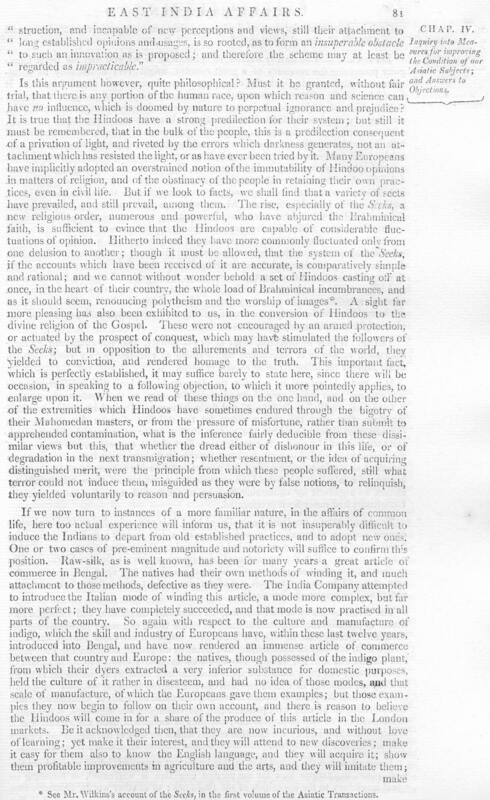 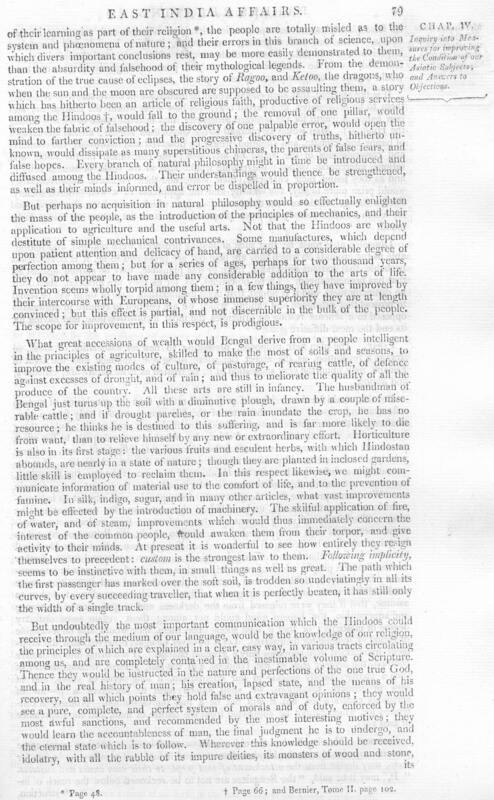 This essay became a much publicized plea for the toleration of educational and missionary activities in India. 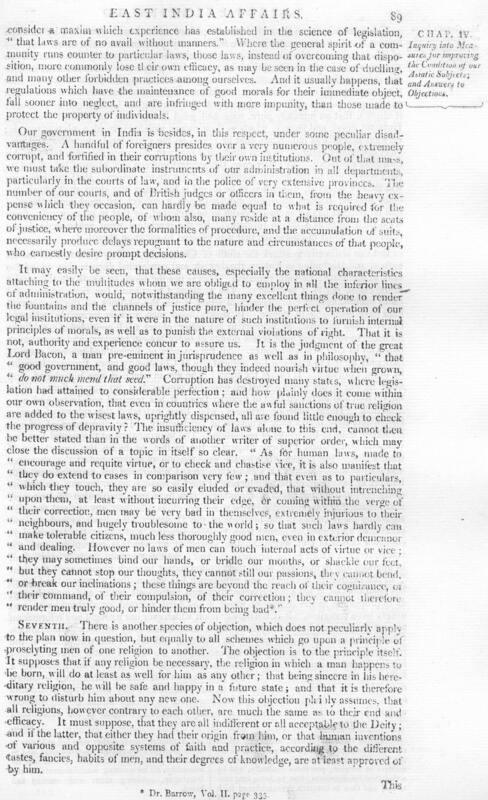 Being presented to the Company's directors in 1797 and to the House of Commons in 1813, the Commons ordered its printing in 1813 within the context of the Charter Renewal. 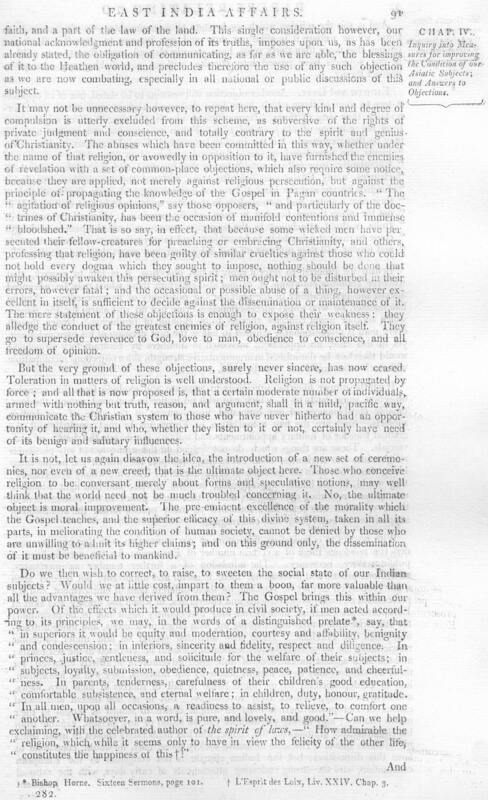 Grant argued that the method for civilizing India in regard to society, morality, and religion would be for the Company to allow Christian missionaries into India along with Christianity's legal establishment. 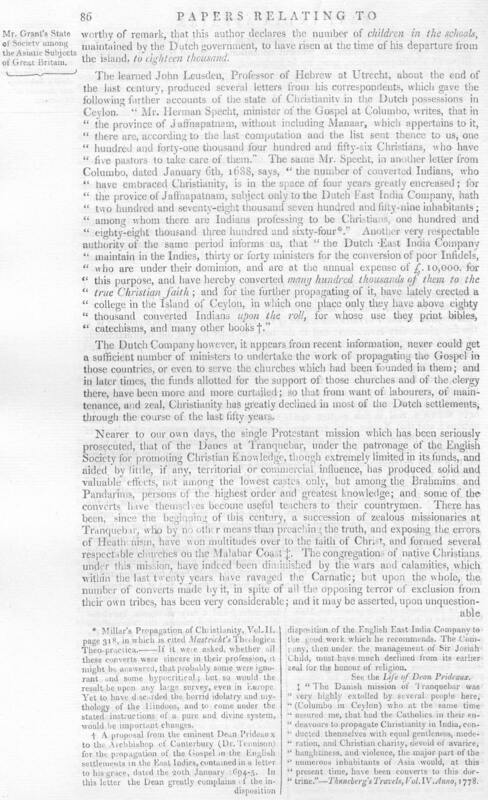 Ironically, Grant's thesis was at odds with the long-held position of the East India Company, which had attempted to prevent Christian missionary work in India. 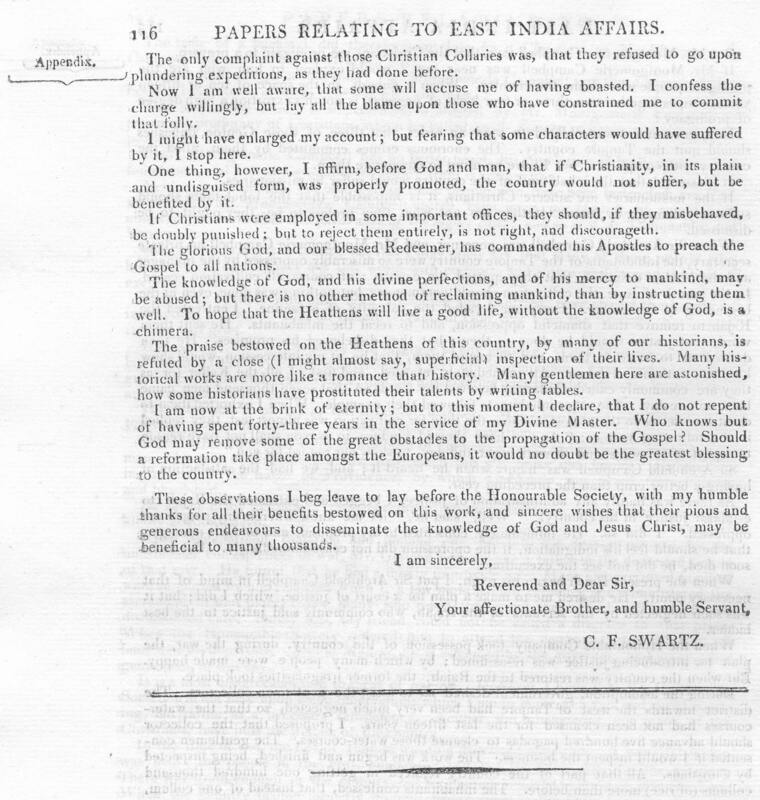 Key figures in the opposition to missionaries in India were Major Scott Waring and the Rev. 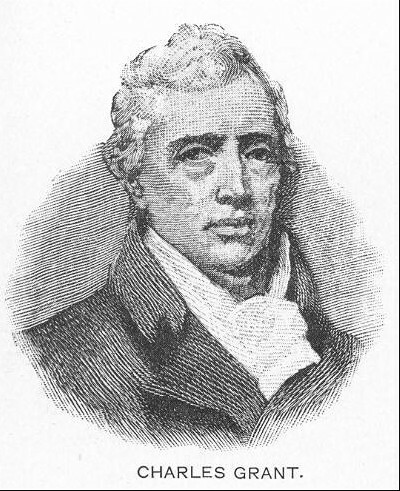 Sydney Smith.